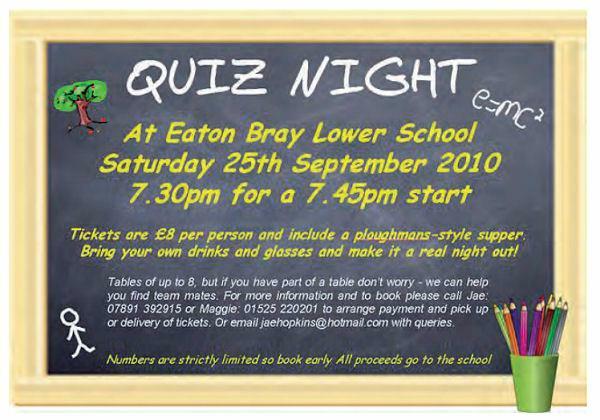 At Eaton Bray Lower School, Saturday 25 September 2010, 7.30pm. This article was published in August 2010. Please see Latest News for more recent information. Tickets are £8 per person and include a ploughmans-style supper. Bring your own drinks and glasses and make it a real night out! Tables of up to 8, but if you have part of a table don't worry - we can help you find team mates. Be the first to comment on this article using the form below. All HTML, except <i>, <b>, <u> will require your comment to be moderated before it is publicly displayed. If you would like your own avatar displayed, read about comment avatars. Please send us your Eaton Bray related news and photographs by clicking here. You are reading "Quiz Night", an article posted on 2 August 2010, which appears in the categories Lower School, Quiz.